I love this office space! It's actually a dining room that is being used as a home office. The room has an understated eclectic design. Notable features include the charcoal-painted built-in backs, the oversized ceiling light fixture, and the orange-patterned area rug. The pop of color in the rug blends beautifully with the hardwood floors, while bringing out some of the color in the books. The rug also grounds the furniture and adds warmth and texture. 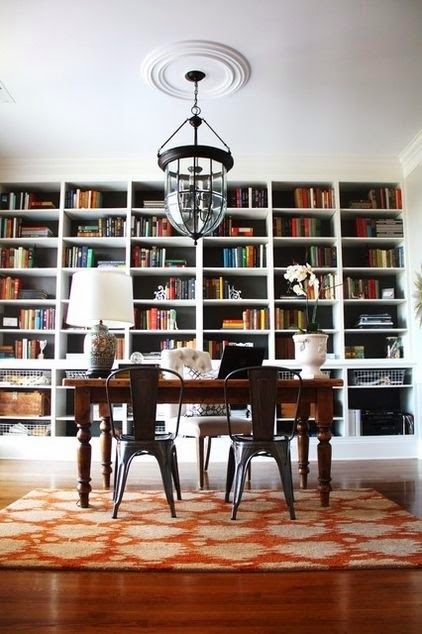 The bookshelves are beautifully styled! Well-edited and well-balanced. And that eclectic selection of chairs...so awesome! Read here about my "chair crush". The industrial bistro guest chairs stand out against the more traditional button-tufted white chair. Lighting shouldn't be an issue with that oversized ceiling fixture! Love the ceiling medallion too! The large scale makes a bold statement and draws your eye up to the ceiling. This office is so beautiful that it would make anyone want to work in there!